We're almost half way through the 2010 season and the Reds have proved that they are contenders. They are currently half a game ahead of the St. Louis Cardinals in the NL Central and have an offense that leads the National League in most categories. The Reds have had their fair share of skids so far, but have flaunted their resiliency by ending them quickly without internal breakdown. Prior to the Reds winning their last four games in a row, they were swept by the last-place Seattle Mariners and were held to only one run during the entire series. The Reds bounced back by sweeping the Oakland Athletics and winning their first game back home against the Indians 10-3. Questions of an insufficient offense were left out to dry. The obvious inadequacy the Reds have this year is relief pitching. Aside from Sir Arthur Rhodes (0.29 ERA), no one in the Reds' pen is getting the job done consistently. Rookie Jordan Smith has done a good job in four appearances (1.93 ERA), but is not Cincinnati's savior for 2010. Teams currently in contention with similar needs are probably panicking right now, but not the Cincinnati Reds. 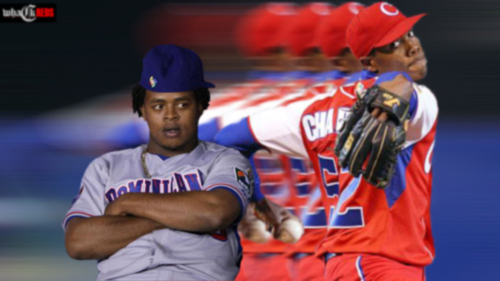 They have All-Star Edinson Volquez just weeks away from returning to the starting rotation barring setback and are currently experimenting with Aroldis Chapman (5-5, 4.12) as a reliever. Chapman will eventually be in the Reds' rotation, but could end up assisting the pen in 2010. On Wednesday, Chapman followed an Edinson Volquez rehab start in Louisville. Volquez went five innings allowing one run on five hits while Chapman went two innings and allowed a run on two hits. Volquez hit 98mph on the radar and Chapman was hitting his typical triple digits. "We still see (Chapman) as a starter," Reds' general manager Walt Jocketty said. "But we feel this season he can help us as a reliever." During the next two weeks, Edinson Volquez will make at least two more rehab starts in Louisville and the Aroldis Chapman bullpen experiment will continue. Both pitchers could be wearing a Reds uniform before the All-Star game. Bob Castellini may want to invest in a new radar gun at GABP.